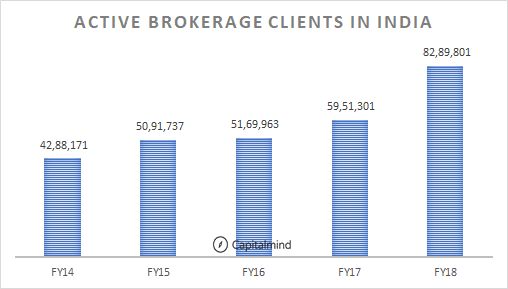 And in the list, it appears like Zerodha, the relatively new Discount Broker, has moved swiftly into third place in terms of number of accounts. Zerodha was just at 160,000 accounts in the previous year and has swiftly moved to more than 500,000 accounts and thus in third place. In fact, it has a growth of 98% a year since 2013! The recently listed ICICI Securities is also growing but the rate is slower – and it’s at only 8 lakh active customers. (IIRC, Active means doing at least a transaction in the last year or so) It says in its DRHP that it has over 38 lakh customers but apparently only 8 lakh of that are active. The number of accounts going to 82 lakh is nice but given that it’s not really deduplicated it’s not a source of information of how many real accounts exist. However you are unlikely to have more than one “active” account. NSDL however says there are about 1.7 cr. 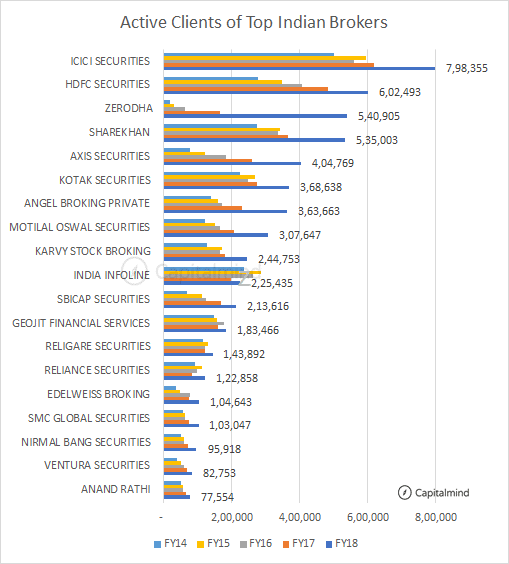 active demat accounts in the country (source). NSDL’s definition of activity is different from NSE, so that will account for the difference. Even if you assume an average of two active accounts per person, that’s 40 lakh brokerage accounts, and that’s just 0.5% of the population. In fact, given that we have about 8 7 crore tax payers (source), the active accounts are only 5% to 10% of the taxpaying population. This means a fairly low penetration. First time investors are also participating through mutual funds, where entry barriers are low for a participant. No power-of-attorney, no agreements to sign, etc. But as mutual funds consolidate we will see relatively small and growing companies neglected by institutions. So we should see more people get into markets to buy stocks that are smaller in size (say 500-1000 cr. in market cap) which aren’t looked at by mutual funds. Lastly, the growth of Zerodha is spectacular. (Disclosure: The folks at Zerodha are friends and I’m proud to have been watching them grow!) Of the top list, Zerodha is the only real discount brokerage where you pay a flat fee per trade no matter how much you trade. The rest are full service brokerages who also provide research etc. Even in futures and options, the full service folks charge per “lot” – but a Zerodha type of player (like Upstox) will have a flat fee no matter how many lots you trade. But like all growing players, even Zerodha has had technical challenges and the growth needs to also come with higher investment in stability and perhaps redundancy. Still, expect more discount brokerages to come and brighten the list. for killing the past, and coming back to life.